"We also do not excuse those terrorist attackers against minorities," they said. "During your presidency and during your election campaign, Islamophobia took a sharp rise and attacks on innocent Muslims, innocent immigrants and mosques have skyrocketed," Nihad Awad the Executive Director and co-founder of the Council on American-Islamic Relations, a Muslim civil rights and advocacy group, said at a press conference. Police in New Zealand say the alleged gunman, described as being in his late 20s, opened fire inside a mosque in Christchurch and that a shooting at a different mosque killed a total of at least 49 worshipers gathered for Friday prayers. Authorities say a lengthy online document, posted after the shooting and linked to the alleged gunman's video of the shooting, praised other mass shooters, advocated white supremacy and detailed hatred for immigrants. "We hold you responsible for this growing anti-Muslim sentiment in the country and in Europe, but we also do not excuse those terrorist attackers against minorities at home and abroad," he continued. 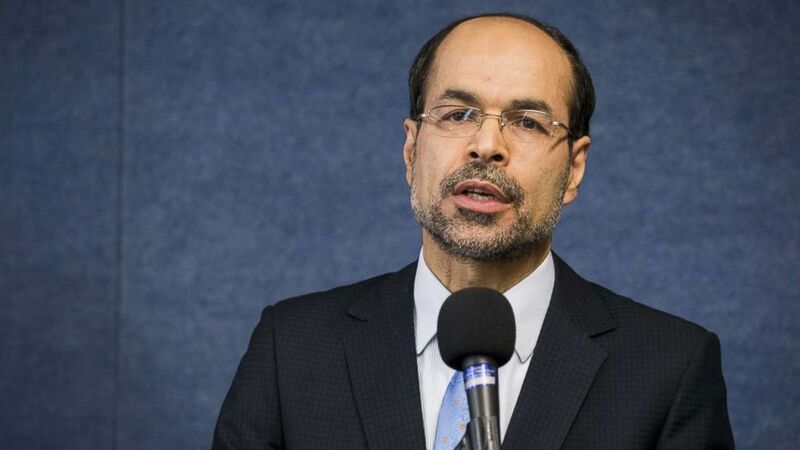 (Samuel Corum/Anadolu Agency/Getty Images) Nihad Awad, Executive Director of the Council on American-Islamic Relations, speaks at the National Press Club in Washington, DC, Dec. 5, 2017. Awad added that Trump's words and policies "matter," and said he hopes that Trump will "condemn this not only as a hate crime but as a white supremacist terrorist attack and you need to assure all of us, Muslims, blacks, Jews, that we are protected and you will not tolerate any physical violence against us because we are immigrants or we are minority." President Trump tweeted condolences earlier Friday about the attack in New Zealand. "My warmest sympathy and best wishes goes out to the people of New Zealand after the horrible massacre in the Mosques. 49 innocent people have so senselessly died, with so many more seriously injured. The U.S. stands by New Zealand for anything we can do. God bless all!" The White House said Friday that it is "outrageous" to try to connect the alleged gunman's purported rhetoric and the president and that Trump "has repeatedly condemned bigotry and racism and has made it very clear that this is a terrorist attack." In the U.S., law enforcement and civil rights group say they have seen an uptick in bias-motivated crimes. The Council on American-Islamic Relations said that they have seen a 17 percent increase in anti-Muslim bias incidents nationwide from 2,213 in 2016 to 2,599 in 2017. They recorded 144 anti-Mosque incidents according to the group's most recent data. The Southern Poverty Law Center reports that there were 784 hate groups in 2014 and in 2018 there were 1020, a 30 percent increase. According to FBI statistics, there was a 17 percent increase in overall hate crimes from 2016 to 2017.